I was the first person ever to breathe through a mask.Imagine living in a world where the most important thing you need to survive is also the very same thing that could take your life. "I need some fresh air. ""Then by all means, go outside. If it doesn't clear your head, it will probably kill you. "Araby lives among the sick and dying. The only thing which separates her from the less fortunate is her accessibility to the air-filtering masks which are credited for sustaining life. Most people would trade places with the girl who has food, shelter, and clean air. For Araby, these amenities are only prolonging the terror and sorrow. She sees the pain of loss and smells the stench of the dead. She lives in fear of touch - not only from the rotting hands of those who are infected, but also from the clean hands of those who care for her. What she fears the most is living a life that was not meant for her to live.As the contagion grows, a city in ruin divides its loyalties. There are three players rallying for control : The prince in command, The religious fanatic spreading propaganda, and a young man named Elliot who has personal reasons to want to overthrow the other two opponents.Being the daughter of the man who invented the life-saving masks, Araby is of interest to all of the power-players involved. Unsure who to trust, she holds tight to her newest ally - a friend from the dark nightclub she frequents. 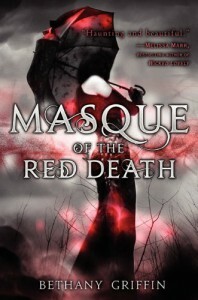 But is her heart (and life) safe with him?Masque of the Red Death is one of those books which is going to make me sit and think about what's to come. This story is a retelling of Edgar Allan Poe's short story of the same name, but with a few different plot twists. If I follow through in my mind what happens in Masque, as well as the following story of The Cask of Amontillado, then I am a bit worried about what is up ahead. However, I have the feeling that this author is going to take what we might already know and turn everything on its ear.The setting, the characters, the story...all of it was beautifully drawn, if death and destruction could ever be described as such. I found myself torn between the steadfastness of Will and the passion of Elliot. Both characters hold secrets and both are willing to do whatever is necessary to protect their causes. For Will, it's his family. For Elliot, it's his vision. I could see why Araby would be intrigued by either of them. I appreciated how I was left wondering who would end up being the most trustworthy of the two. As of right now, there is no clear cut answer. One highlight of the book is a scene in which one of the young men dangles our female lead over crocodile infested water. On purpose. Ah, young love. Isn't it grand?Thankfully, the story went much deeper than just another tale of, "which boy should I choose?" I felt like the love triangle was merely a byproduct of the environment and need to survive. There was no time to sit around and contemplate which male might be the dreamiest, or the sweetest, or some other fluffy thing that might have sidetracked us from the intent of the book.I will be anxiously awaiting the second installment of this series. There is too much left undone that I want to know now. Who will live and who will die? What is to become of this world in chaos? Will there ever come a time when the masques are no longer needed? It will be far too long until I get a chance to find out!